The Freemaker Adventures is the latest in a series of LEGO Star Wars animations released over the last few years. This one is focused on the Freemaker family and their experiences living under the oppressive rule of the Galactic Empire. 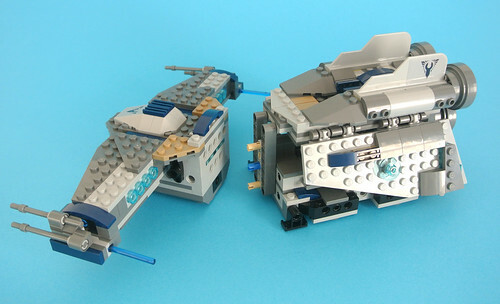 75147 StarScavenger is the larger of the two sets based on the show and includes most of the major characters. The official images of this set look decidedly unappealing, particularly given the price of £49.99 in the UK or $49.99 in the US, so I was hoping to be pleasantly surprised when it was constructed. All three members of the Freemaker family are included in this set. Rowan is the youngest of the siblings and is revealed to be Force sensitive in the first episode. 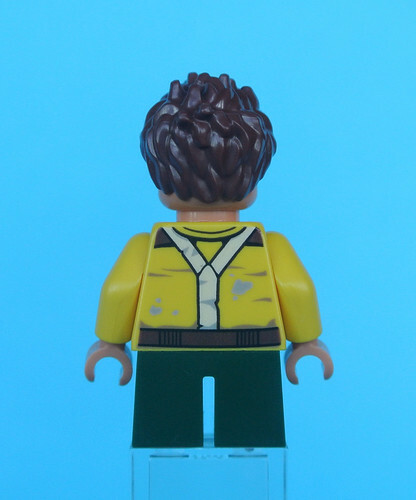 His head is printed with a cheeky grin which suits the character perfectly while the torso features a scruffy yellow jacket and a simple belt. It is worth noting that the short legs have only appeared twice before in dark green so it is pleasing to see a relatively rare colour in use. 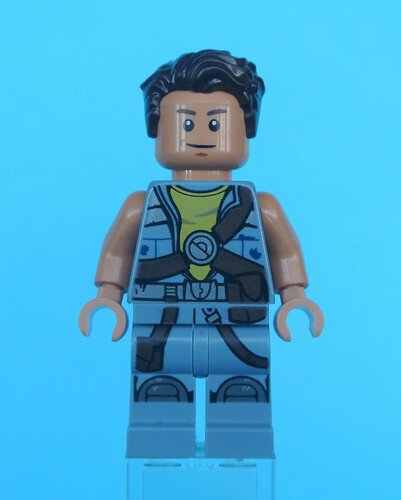 Rowan is equipped with a wrench, a pair of binoculars and a white helmet which can be worn as an alternative to his reddish brown hair. A trans-neon light blue crystal is also included and this represents a piece of the Kyber Saber, to which Rowan is mysteriously drawn. Zander is Rowan's older brother. 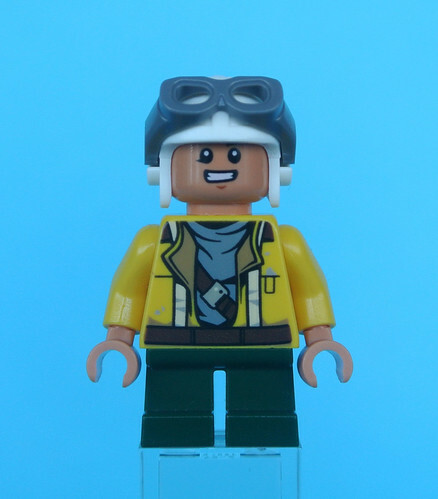 He is a skilled mechanic and sports a worn sand blue jacket over a yellow shirt which seems appropriate given his role on the team. This rather generic outfit is nicely detailed and would be ideal for a background character in any Star Wars creation. The printed legs are similarly versatile and match Zander's jacket very nicely. I also appreciate the dark flesh skin tone which is used as this is far less common than the typical light flesh so three new heads are particularly useful. It is also nice to see the wavy hair piece appear in dark brown for the first time. Kordi is the eldest of the Freemaker siblings and she commands the StarScavenger. 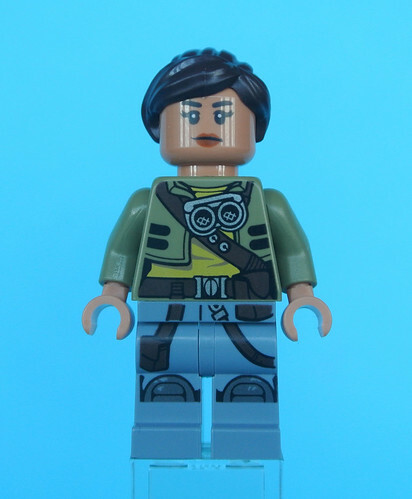 Her hair piece is more common but the rest of the minifigure is brand new, matching her appearance in the animated series and offering some useful elements for creating your own minifigures. Her torso is decorated with a short sand green jacket and some goggles which looks splendid. Kordi's legs are the same as those of Zander. It would have been nice to see some different legs used but I think they look great and this is testament to their versatility! She is equipped with a dark bluish grey circular saw while her brother uses a wrench. 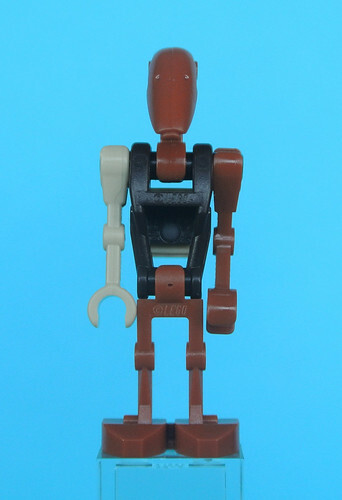 R0-GR is a relic of the Clone Wars and considers himself quite valuable as a result, although he is still willing to serve the Freemakers however possible. 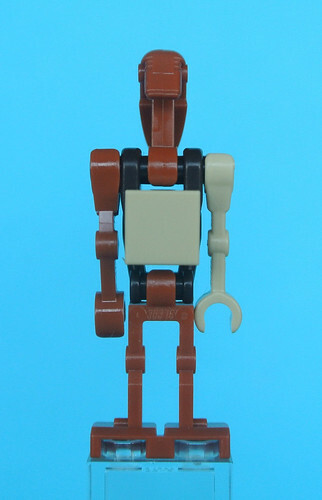 His body parts are mismatched but the tan, dark orange and dark brown colour scheme works quite well in my opinion. Unfortunately the 1x1 tile on R0-GR's back is not printed, unlike in the animated series where it is decorated with a faded insignia. Nevertheless, he looks appropriately rusted and I appreciate the inclusion of a red mug which reflects the droid's rather lazy personality! 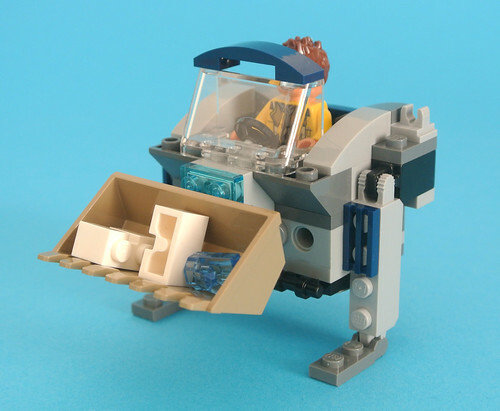 The StarScavenger is designed for collecting valuable materials and is equipped with a small digger accordingly. A couple of white bricks are included with the Kyber crystal and these can, in theory, be collected in the bucket. However, the bucket is mounted too far off the ground for this to work despite the click hinge which allows you to adjust its pitch. Furthermore, the legs do not allow the model to balance and it tends to fall backwards no matter how they are posed. There is room for a minifigure to sit or stand inside and you can store their accessories on the clips provided which is a nice touch. Unfortunately, the model looks as bad from the back as it does from the front, with a dark blue curved slope hastily slapped on to avoid leaving the figure totally exposed. 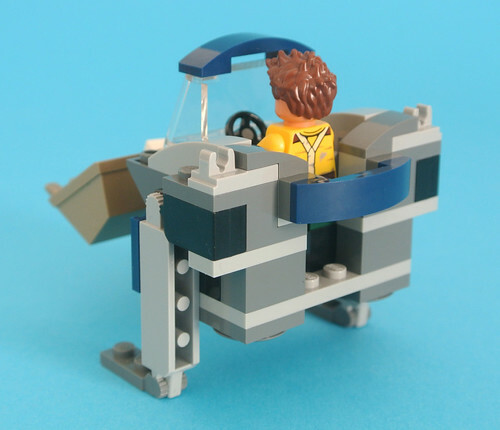 I am surprised that this model was actually approved for use in an official set as it comes nowhere near the typically high standards of LEGO product design. 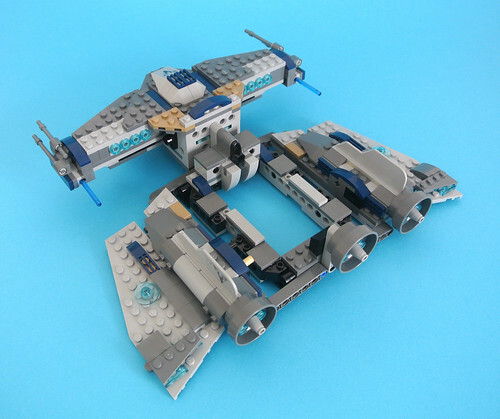 The shape of the StarScavenger reminds me of 75025 Jedi Defender-class Cruiser but this model is far smaller, measuring 22cm in length and width. The combination of light bluish grey, dark bluish grey, dark blue and dark tan attempts to recreate the worn appearance of the craft in the show but I think it looks dreadful. 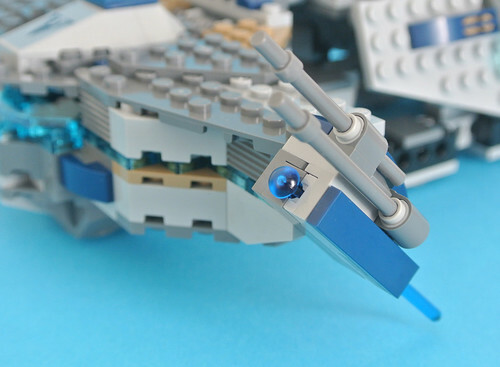 Some trans-light blue elements are used as well but these only reduce the appeal of the craft in my opinion. The roof of the cockpit hinges open to reveal two seats and these are arranged one behind the other. 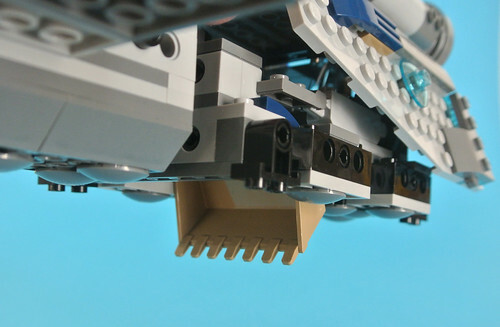 I like the printed console but the rest of the interior looks totally unfinished as Technic bricks and pins are left exposed. 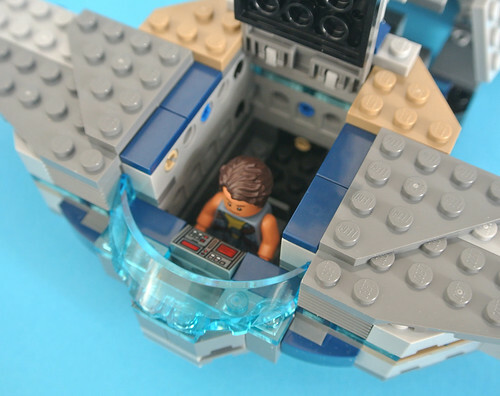 Nevertheless, I am pleased to see a cockpit with room for a couple of minifigures. The cockpit is flanked by a pair of poseable gun turrets, each of which incorporates a spring-loaded shooter. These can be rotated all the way around and the launchers are incorporated quite nicely thanks to the dark blue tiles which are used to cover them. The back of the model, on the other hand, is a complete mess. The engines on top are nicely shaped but the panels which form the hull on either side are attached using a few click hinges and they feel rather loose, making it quite difficult to hold the model without breaking it. Moreover, the three engine nacelles are attached using only a single Technic pin and they too are impossible to grip as a result. The reason for the flimsy rear section becomes clear once they are divided to reveal the cargo bay. This entire section folds down to the sides of the model, allowing easy access to the space inside, but yet more Technic bricks and pins are left exposed and they look terrible. A few tiles could quite easily have fixed this. The loader fits inside the cargo bay but tends to rattle about as there is nothing to hold it in place. There is also no easy way to deploy or collect the loader so you must instead lift it out manually. I am sure it would have been easy to incorporate a method of pulling a pin which would release the loader from beneath and then replacing that pin in order to pick it up again, akin to the mechanism in 10195 Republic Dropship with AT-OT Walker. I like the positioning of the loader inside as this allows you to lower the bucket for the collection of salvage, just as we see in the animated series. However, the four Technic elements mounted at the corners of the cargo hold are presumably intended to act as landing gear and they are completely useless as they do not extend beneath the sliders which hold the underside of the model together. Most of the features of this set have been very poorly implemented but none more so than the splitting function. 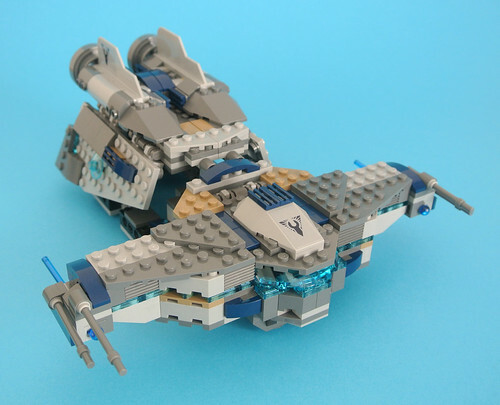 In The Freemaker Adventures we see that the StarScavenger can divide in half to send the cockpit section on a solo mission and this is recreated here. Unfortunately, the two halves are only secured using three Technic pins, just one of which is a friction pin. This obvious flaw leaves the ship feeling incredibly fragile as the connection is very weak, although I must acknowledge that they are unlikely to actually separate unless they are intentionally pulled apart. I have never found LEGO's original Star Wars creations to be very impressive but this is by far the worst yet. The StarScavenger looks absolutely awful and feels even worse when being flown around as the panels wobble to a ludicrous degree. The minifigures, on the other hand, are excellent. They will appeal to those who watch the show but their unique outfits are also valuable as they could easily be used for generic inhabitants of the Star Wars universe. The flimsy design leaves me wondering whether the model was created with versatility in mind. An impressive variety of elements are included and I think they could be used to create a broad range of different craft. However, this does not make up for how poor the StarScavenger is and I would not recommend this set, except perhaps at a substantial discount and to fans of The Freemaker Adventures. This set was provided for review by The LEGO Group but the review is an expression of my own opinions. 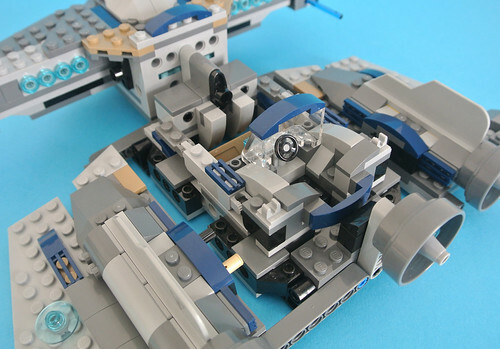 Well that is rather pathetic for a craft designed with Lego in mind specifically to be so sloppy. At least we got a new Dengar out of this sub-theme. BrickBros UK built an absolutely fantastic representation of the Freemakers' repair shop on The Wheel using parts from this set ( https://www.youtube.com/watch?v=9jirFRjHQnY ), and that model alone makes me really want this set to make it using the accompanying tutorial; especially since the minifigures, as you say, are pretty much perfect. But yeah, about what comes in the box with the official instructions - blech. This reminds me of 1593-1. Even as an 8 year old, I couldn't understand how such an odd and sub-standard model could have been made. It was only a few years ago that I realised it was a Persil promo set. Maybe they pulled the designer of 1593 out of retirement to work on 75147. But £16 from Argos?????? How did you manage that, Kane prime? LEGO always seems to make a mess of their original vehicles but this is a new low. I'm glad to see such an honest review, despite the set being provided for free. Thanks! It upsets me that the design is so ugly. It's horribly ugly on the show too, and the show is a ton of fun. The black and red craft from the show is one of the best designs Star Wars LEGO has done. I'd love to have the mini figures though. Thanks for the link to the Alternate build. I wasn't very impressed with the ship either and was going to try and redo the back section of the ship but I think I'm just going to do the workshop Idea instead. Pass. The last two years I sort of mindlessly been getting Star Wars stuff. This year I've put the brakes on that and am only getting what truly interests me. And wasn't going to be one before reading the review, but this confirms my belief. As a general rule of thumb, I've found non-movie Star Wars items to be less inspired. Thanks for the review. Seems this one is indeed the money saver I expected based on earlier pictures. So I price matched it to toys r us ! My bad on exact details ! It's currently $39.99 online at Target in the US. The piece count made the set seem more impressive than it actually was, it seems. Only the minifigs seem particularly outstanding. Oh well, I need to save up for that Disney Castle anyway. Thanks for the excuse to do so, Lego! Freemaker Adventures? First time Ive heard of this. I alway wonder in toystore where this set originates from. Im not interested because I have no backgound story. I Will check Freemaker Adventures. This looks very reminiscent of the defender class cruiser like your have said . I think the defender is an excellent model but this does not look as good. Brick Bros UK have some excellent ,and I mean excellent, alternate builds. I recently bought the FO Snowspeeder discounted and rebuilt it as the FO tank. Much better than the official set. I really recommend checking them out. Other than the mech being weak, I don't really agree with you on this set being weak aesthetically. I don't have any problem with exposed Technic, especially on the INSIDE of a model, and I love the overall color scheme. It fits the Star Wars "used future" look quite nicely while still standing out nicely from familiar vehicles like the Falcon or X-Wing. Structurally, the set also succeeds at feeling very much like it belongs in the Star Wars universe without feeling too derivative of other ships, and it's got a pretty good size, piece count, and character selection for its $50 price point! The fact that it feels so fragile and wobbly in hand is definitely a lot more concerning to me than your comments about the aesthetics, though, and if this set had been on my wish list those comments might make me think twice about getting it, or at least start thinking about ways to modify it and make it sturdier. The Freemakers are definitely strong character designs, and I like their racially ambiguous Nougat skin tone. R0-GR is kind of generic in construction but brilliant in concept (a salvaged and reprogrammed battle droid). I also noticed in this review, there is stil no printing on short legs! If they can print small and complex shapes like arms, this should be possible too, right!? Horrible set for Great series. Makes me sad. @Casper_van_hobbes: LEGO is capable of some printing on short legs, at least through their contractor in China. They demonstrated that with http://brickset.com/sets/5002145-1/Rocket-Raccoon (which has printing on the front and sides of his legs) and http://brickset.com/sets/71005-2/Bart-Simpson (who has part of a slingshot printed on the back of his legs). 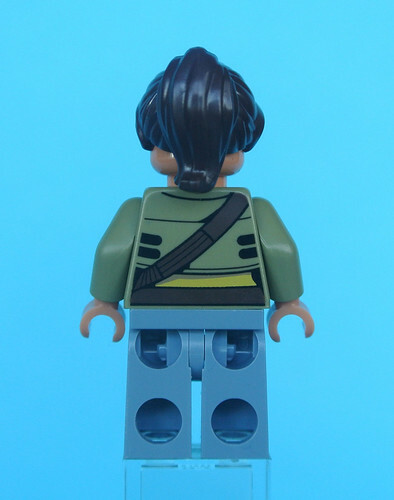 However, since most of the surfaces on the short legs are so small, I think the LEGO Group usually figures they're fine without additional printed detail. 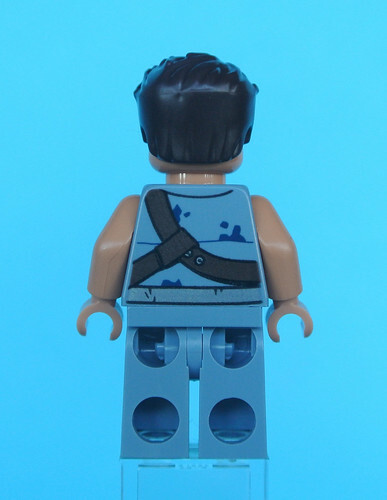 It helps that the short legs are designed to look as though their belt line (one of the most frequently printed parts of normal-sized minifigure legs) falls on the torso rather than the legs element. ^^ There's also printing on all Disney CMF short legs. A very well-deserved, proper throttling of a thoroughly disappointing set. I enjoyed the animated series and thought the heroes' ship looked & worked just fine in it, but this toy/model just doesn't cut it. I don't think it looks terrible, but when you get it in your hands things quickly fall apart, both literally and figuratively. LEGO hasn't had the best week on this website have they? I absolutely loved the first season of the show so I will still be picking the sets up but I am really disappointed in the quality of the ship. It looks ghastly, doesn't it? Definite pass on this one. Wow, that is pretty bad.. one of the first times I've seen you review a set and straight-up say "don't buy it"
Haven't seen FA, probably never will, and completely uninterested in this set. I bet this set won't sell well at all. Wow, I find myself in the minority. For once I am in complete disagreement with the review. I actually really like this set. I love the color scheme, it's very reminiscent of the ship on the show. Obviously the mini figures are great, but I really enjoyed this build also. And the opening function to store the loader, I thought was excellent and works quite well. I haven't found an instability with this model like the review suggests. I'm just finding myself quite surprised at the review and comments. I really enjoy it. That walker thing looks awful. The rest of the ship, ok. But that walker. The eclipse fighter looks 10x better. Wow. I could build something that good ! The walker looks like something out of the late 90s Juniorised era. The model matches quite closely with the animation. Well as to whether the design of the ship looks good it really depends on individual taste. To me this model has more of a Star Trek flair than Star Wars, and that is not a bad thing. It uses a lot of interesting parts, but it costs like 75 euro in Sweden so I will only get it if it´s 50% off. 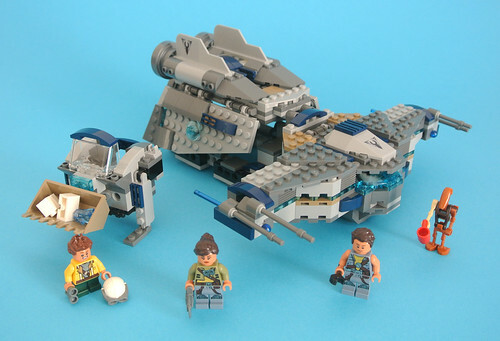 This is one of the sets that actually has put me off buying LEGO Star Wars, and I don't own it. I think the ship itself looks absolutely amazing, but for the price it seems fairly small and the play features are unimpressive. 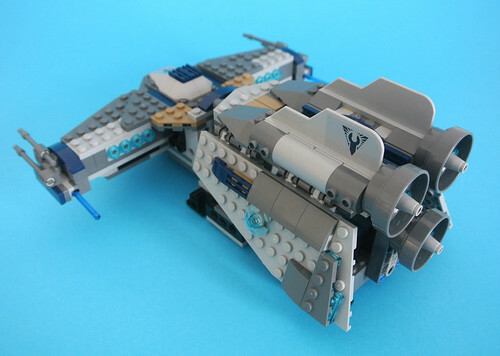 I'd argue that The Phantom from Rebels (75048) has just about as much in terms of features, and for £20 more you could have got The Ghost (75053), which had about 400 more pieces and was much better value for money. I feel like this set looks too small for the price point (especially the UK price point, which is absolutely disgusting), and any success for this line in the UK was pretty much dead in the water as it has released months before the show has done, so... how are LEGO and Disney supposed to expect it to sell? It's tied in with something that's unavailable. I disagree with some aspects of the review, though. I think the model itself looks pretty amazing (let's not talk about the walker...), as a smaller scale version of the ship and the design lends itself to being a Microfighter in the future. I'd love to have a Microfighter of it next to my Ghost. It's meant to look scrappy and a bit uncoordinated, and i think they've done an excellent job of keeping that aspect. The colour scheme works, though - like both versions of The Ghost - it's a little inconsistent. But hey, I don't think any two models of the Ghost, LEGO or otherwise, are consistent in colouration, so it's not surprising.